The soccer team found its first successful road trip of the season, beating Drake 1-0 in Des Moines on Thursday. 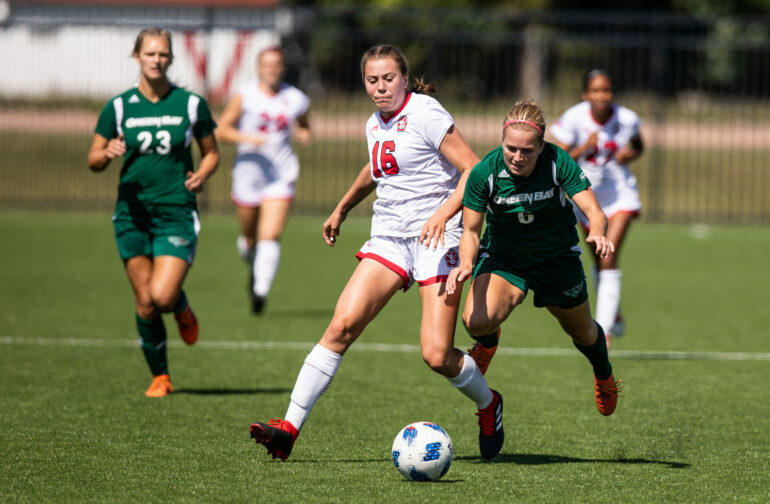 The first 70 minutes of the game went without a goal until sophomore Abby Ostrem sent a pass in the direction of freshman Joana Zanin, who headed the ball toward sophomore forward Maddison Sullivan. Sullivan’s strike hit the hand of Drake goalkeeper Kelsie Stone, but carried enough backspin to roll into the goal, putting the Coyotes up 1-0. The goal was Sullivan’s first of the season, and second of her career at USD. Three of the Coyote’s four shots landed on goal. Junior Taryn LaBree placed both of her shots on goal and junior Kellee Willer added a shot. Sullivan was the only Coyote to convert her shot to a goal. Drake shot thrice more after the goal but was unable to get the ball past senior goalkeeper Parker Rytz, who saved all three shots. Rytz notched five saves and her third shutout this year. She has allowed nine goals in eight games this season and is third in the Summit League for with 44 saves. The 1-0 victory pushed the Coyotes to 4-2-2 on the season, matching last seasons win total. USD has won four of their last five games and beat Drake for the first time since 2014. The Coyotes will be on the road again Thursday, as they take on New Mexico State in Las Cruces, New Mexico. USD returns home following the game for the final non-conference match with UMKC at First Bank & Trust Soccer Complex Sunday. It is Senior Day and the kickoff for that game will be at 1 p.m.
New Mexico State is 1-7 on their season and is coming of a 1-0 loss to rival New Mexico. UMKC is 7-3 overall, winning three of their last four matches. The Kangaroos will be playing South Dakota State Friday before stopping in Vermillion for Sunday’s matchup.